The former ANZ Bank Building in King William Street, Adelaide, now owned by the South Australian Government and named Edmund Wright House, was designed by E. W. Wright and was built in 1875-78 as the Bank of South Australia. The building is notable for its architectural accomplishment and the significant role it played in developing awareness of the risks to Adelaide’s built heritage. In a booklet published during the campaign for its preservation in the early 1970’s, it is described as follows: “As a city building it is remarkable in that it is fully three dimensional and not just a facade. Stately and sumptuous, each side relates completely to the next and all are superbly proportioned and detailed. “The magnificent front, with its thicket of composite and Corinthian columns, is an architectural masterpiece equal to any in Australia. The pillars are delicate things, finely proportioned, each hand carved. The entrance leads through a corridor, flanked with fluted polished columns in richly figured marble, to the superb banking chamber. “The skills and craftsmanship that have gone into this building are almost unknown today. Every stone has been hand worked, the lavishly used columns are perfectly proportioned, the entasis subtle and the fluting immaculate. “The capitals, keystone heads, and friezes are the work of William Maxwell, who in his time was Australia’s finest sculptor. In addition to his statues of Burns and John McDouall Stuart in Adelaide, he also carved the Altar in St Mary’s Cathedral in Sydney, and the E.S. & A. Bank in Melbourne. Since its purchase by the State Government it has had a range of occupants. Currently it houses the Migrant Resource Centre. 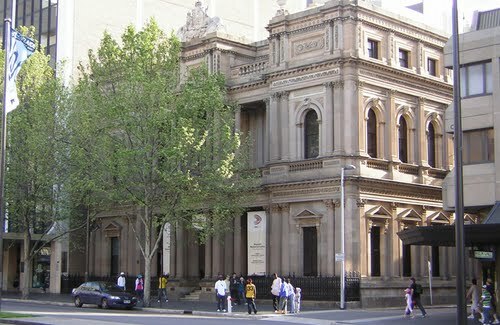 The Bank of South Australia (Edmund Wright House) is historically significant for its association with the development of financial institutions in South Australia and in particular the Bank of South Australia one of the earliest banks in the State which was initially connected with the South Australian Company. The building was in continuous use by three of the major banks in Australia for over 90 years and is one of the few significant architectural statements of 1870s commercial architecture remaining in King William Street. The building represents the combined work of two significant architects – South Australian Edmund Wright and Victorian Lloyd Tayler – and is of exceptional architectural merit as an example of Victorian era Classical architecture with Renaissance influences. Victorian aesthetic principles of commercial architecture are also illustrated in the design of this building and its position highlights the focus of the commercial district of Adelaide in the nineteenth century. It also features quality craftsmanship and the use of both imported and local materials epitomising the wealth and status of banking institutions in South Australia during the boom time of the 1870s. The building is also significant for being a catalyst for public debate and concern for the built heritage of South Australia when it was scheduled for demolition by Mainline Corporation in 1971. A prolonged public campaign culminated in its purchase by the State Government in November of that year. Edmund Wright House is currently derelict, not occupied, what happening? this is one of Adelaide’s most artistic buildings. the interior is magnificent. it would make a great art gallery. Why is this building currently being advertised for sale on a 99 year lease by the SA govt? It is too significant to Adelaide for it to be discarded like this. There are so many public uses that could be encouraged in such a setting. For example a venue for chamber music and other recitals. What an auspicious start to married life, and the first of many happy couples to pass through those doors no doubt! We’d love to see any images from the wedding if you wouldn’t mind sharing Graeme, it seems your nuptials were the start of a particularly important point in the building’s story. please contact me at the stated email address and I will certainly provide photo attachment. I am curious, is this the same Bank of South Australia that was the State Bank, that collapsed? Yes, although it had certainly moved on to new premises by the time of the collapse 1991. Was just ‘surfing’ when I re-stumbled onto this site… THANK YOU “Editor” and FYI Lorraine and I celebrate 45 years on 2 January 2018… Grandparents of two lovely girls and Grandson. Our own Three “Children” now ofcourse Adults in their own right, are loving and most supportive. Forty Six years ago since we met, oh how so much has changed but for us, we sit, snuggled up on the settee, to watch our favourite TV shows. I have a photo of Bon Scott (Fraternity and later AC/DC) and Irene after their wedding in this beautiful building (standing out the front) – 24th January 1972. Also, I used to work for Torrens College of Advanced Education in the Music Dept in 1980 and we used to host free Chamber Music Concerts every Friday, put on by the Music Students. They were always full and the accoustics were fabulous. So sad to know this is empty. How fascinating – there can’t be too many photographs of Bon Scott in formalwear in existence! If you would care to add the photo as a comment we would love to see it.